There are two versions of the Zoom 1202. The one shown here is the version with a rear casing that runs the full length of the front panel. Modding this version costs £75. The other version has a rear casing that only extends the width of the knobs on the front panel, as thats how wide the internal PCB is. Presumably Zoom wanted to save some money and reduced the case size on later versions, although both versions have screw holes for mounting both size rear cases, so who knows. This smaller cased version will cost £85 to mod as it involves a bit more work, not least because it uses a different surface mount version of the RAM chips that are a lot more difficult to work with. If you were looking at getting hold of a 1202 for modding purposes we would advise tracking down the larger case version, as they seem to be a little more reliable. This more refined nature for the 1202 does come with a major benefit when the unit is circuit bent, in that with the addition of a reclocking knob the reverbs stay remarkably intact as you clock the unit down to slower system speeds. As the clock speed of the system slows, the reverbs become more and more granular until early reflections turn into creaking glacial lumps of noise and tails decay into a huge sea of sound. Unlike with many similar units, running the system at these low clock speeds doesn't introduce horrible squealing aliasing noise, or a floor of hissing white noise making the effect unusable. 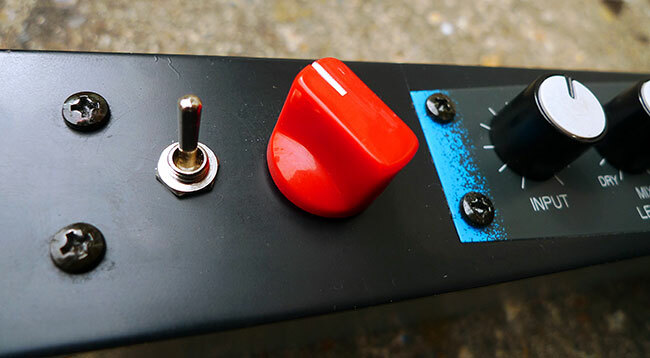 The reverbs produced may be unlike anything you've ever heard, but they are definitely a product of the audio fed into the unit rather than being completely disconnected sound. The 9 way switching matrix operates on any effect that uses the onboard RAM. This includes the reverbs, delay, chorus, flanger, etc. The switching matrix allows you to apply what sounds like various kinds of comb filters, pseudo ring modulation, bit crushing, distortion, and what can only be described as audio smearing™. 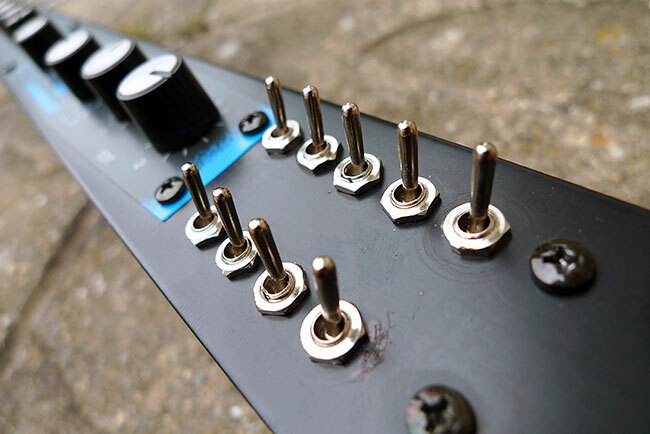 Each switch has a certain effect variation that is usually associated with it, such as a certain frequency of sample chopping or distortion intensity, although its effect can be altered depending on which other switches are activated simultaneously. You have to activate more than one switch at a time for any new effect to be applied, but when two or more switches are activated their associated effects will combine to produce something new. Usually the original signal is not effected, but the effect signal will be, i.e. in a delay setting the original dry signal will pass through the unit unscathed, but the actual delay signal will be mangled beyond recognition.. The demos below show a selection of the effects these mods can produce. The first is an example of reclocking the reverbs. The second demonstrates the delay and loop freezing effects, while the third is some random bent acid effects. If you want your ZOOM 1202 modded get in touch using the CONTACT form.